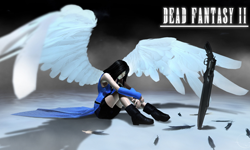 Dead Fantasy is a series of fan-made, short films by animator Monty Oum. The films feature various characters from both the Final Fantasy franchise and the Dead or Alive franchise against each other in a battle royale. The project started in summer 2007 and episodes are still being made. Episode duration is approximately 4-11 minutes. Monty creates CG models of the fighters himself, and often designs original weapons and costumes. 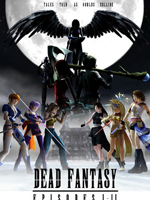 Characters featured in Dead Fantasy include (but are not limited to) Kairi, Tifa, Yuna, and Cloud representing FF, and Helena, Kasumi, Momiji, and Ryu representing DoA. The film series is very popular among fans, and there are several reasons why. First, the quality of the graphics are good. Monty is able to do great things with fabric, hair, and lighting. Next, the fight choreography is well-planned, creative, and exciting. Fans will recognize plenty of moves from the characters' respective games. Third, the nostalgia or coolness factor. It's already fun seeing reminders of old games, it's even better when all those reminders start crossing over and interacting with each other. Lastly, the ongoing nature of the series. A mysterious plot is forming and there's no sign of the project being dropped. Fans keep coming because the CG continues to get better and the story is still untold. At the time of this writing, Rinoa has only appeared in one film: Dead Fantasy II. But what an appearance. She seems to be the most powerful member of the series, which makes this Rinoa fan very happy. Rinoa joins the fight during the second half of Dead Fantasy II. As her comrades are about to fall into a lake of hot lava, Rinoa enters by casting an ice bolt that freezes the entire lake. Her sorceress powers are in full gear, as her angel wings never disappear. She wields both a custom gunblade and blaster edge. She can use spells such as Tornado. Rinoa also demonstrates the ability telekinesis when she levitates large monoliths and hurls them away. After thoroughly beating down the DoA warriors, Rinoa summons several portals for pairs of fighters who are then teleported across the world. The episodes after this have focused on one-on-one battles between pairs that were teleported away. While Rachel was intended to be paired with Kairi, Rachel slipped away and got into Rinoa's portal. Thus, it is suggested that Rinoa and Rachel will fight in the future, or that they are fighting at the moment. Acts as the creator's art gallery. Streams awesomeness in video form. Staffer page at a Halo-oriented site. Another streaming video source. The funny archetype wikipedia. A wikia all about DF.